It doesn’t matter if you are looking after a project at home or at work, you must go through some process of project management if you want to achieve the right look for the right price, too. Understanding the complexities of any project is important and using these to devise the right plan, which will allow for successful completion on time. 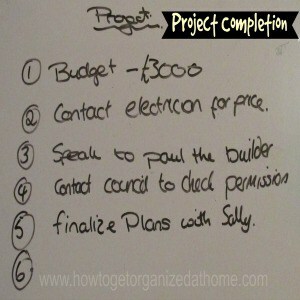 Create a project, which you want to complete and the ideal period that you are hoping for the project to be completed. It is important that you break down the job into different steps; you might need to have these completed by different trades or assigned to a different person but this is your plan to complete the first steps of the project. The plan might need altering as you move forward, but in essence, you need to ensure you manage to complete all your task. There are different tools that you can use to help you manage the project you are working on, but the most important is time; you must understand how different factors can affect the successful completion of the task in hand. To plan successfully any project you are going to need organization skills to manage your team to see you through to the end. You must always be fully aware of the outcome of the project, you must make sure that you can close one at a time, completely before moving onto the next, even if the client is steering in that direction. Knowing the end objective for each project you work on can help with the finalising and ensuring the project completion to the clients satisfaction. That client can be you, but by looking objectively at a task, it can help you to plan a more successful completion of a job. Be aware of the risk of things going wrong. What strategies do you have access to that will help in case of a problem? This could be a mentor at work, if it is a business project. A personal project might require a fund of money for the unexpected. Create a checklist for the different stages; you might start with an overview of what you need the project to look like at completion. Working with this can help you to bring in any other people to complete tasks as required. However, if it is coming to completion, creating a checklist can ensure that you tie off any loose ends, including the disposal of any rubbish that can quickly accumulate, if the project involves any manual labour. Evaluating throughout the project will ensure that things are moving forward, there is nothing worse than assuming a job is complete to find steps are missing. It can save problems from developing which are more difficult to solve if left too late. It is important that at the end of a project that you take time to thank individuals for their work and to talk to them to see if you can help them in the future, maybe future work or even a reference if you have employed the skills of a contractor. If the project is one from a business standpoint, it is essential that the client is happy for the outcome. If you have seen a project from the start to completion, it can be satisfying and it is important to try to implement these strategies, because there is nothing worse than trying to manage a half completed project. This causes problems with accessing the completed work quality and showing that you are able to move forward, but it is important that you are able to take the project through to completion, it demonstrates your skill and ability to manage a team even under difficult circumstances. It is important that you consider the completed project and to note if there is anything that you have learnt and if you would change anything, if you could participate in the project again. This way you can learn to improve your own skills in project management. Improving your own skills is key to your self-development, if you feel that you are missing a key skill it is possible that you could look at career development and consider any training option available. Therefore, whether for business or personal if you are able to manage a project, knowing the steps you need to take to understand the outcome is an essential skill to learn. Putting your skills to practice is great if you have a project you want to complete at home or even in the office.